When you do not know how to describe your feelings, flowers will do all the talking for you. Our Sally arrangement is a sumptuous display of twenty four ruby red roses painstakingly inspected to ensure perfection. 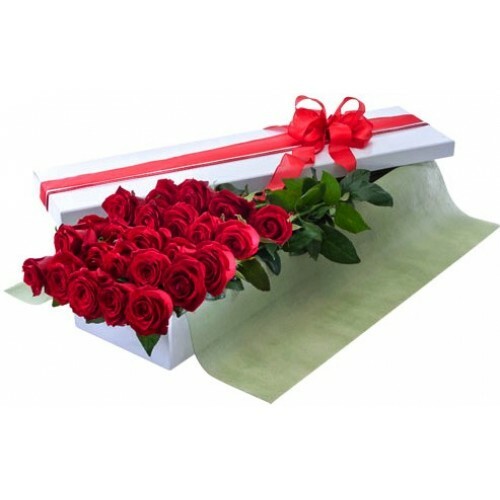 Imagine the look on the face of your loved one when they hear a knocking at the door, and open it to be greeted by a delivery man holding an elegant presentation box especially for them. Once they have removed the lid, they will be astounded with the display of roses and immediately they will feel loved and appreciated, while simultaneously appreciating your thought and care in organizing such a romantic gesture for them. Making this happen is as simple as a couple of clicks on this website.